Comic Mint is the Premiere Gallery for Pop-Culture Collectibles. Specialists of Simpsons Animation Art since 1993, as well as other rare animation, and a magnificent selection of original comic book artwork by some of the world's leading artists! This stunning piece features Bugs Bunny and Elmer Fudd in a famous scene from the classic Chuck Jones theatrical short: What's Opera Doc? In 1994, What's Opera, Doc? Was voted #1 of the 50 Greatest Cartoons of all time by 1000 members of the animation field. 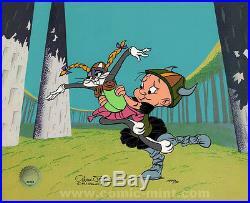 The cel is hand signed by Chuck Jones (September 21, 1912 February 22, 2002). This piece was produced in a general edition size of 750 pieces (worldwide), however, this is a RARE Artist Proof numbered AP44/75. The artwork is comprised of a single hand painted cel placed against a photographic background, with an image area measuring 16.5" x 13.5" inches (unframed). 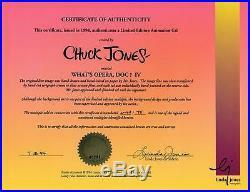 The cel has the official Linda Jones gold seal (lower corner), and is accompanied with a certificate of authenticity. We are an AUTHORIZED Studio Gallery! The item "BUGS BUNNY What's Opera Doc RARE A.
Warners Ltd Ed CEL Signed CHUCK JONES" is in sale since Saturday, August 19, 2017. This item is in the category "Collectibles\Animation Art & Characters\Animation Art\Limited Editions". The seller is "comic-mint" and is located in Burbank, California. This item can be shipped worldwide.